Following is the English translation of an article which I penned for the January 2017 issue of a monthly Turkish newspaper focusing on the arts, Istanbul Art News. IAN requested I project on the arguments on ethics v.s. aesthetics surrounding the series of images which the experienced AP photojournalist Burhan Ozbilici captured as he was on duty that day to cover the opening of an art exhibit in Ankara, during which the high profile assassination took place. There are certain prerequisites to photojournalism. You have to be impartial, you need to focus on the subject, the event unfolding, and try to pool together as much information as you possibly can into one frame so that the reader can see as many aspects of “the scene” as possible. Your duty is to be the eye of the spectator, in this case your reader, and your priority is to relay the news, with aesthetics taking second place over the journalistic concern: work wide angle, followed by close up of details only if you have the time or the chance. Then there are the ethical concerns regarding recording dead bodies. The photojournalist needs to approach the subject with respect for human dignity. Image of a corpse by itself doesn’t mean anything, and publishing images of decomposed bodies, or bodies which have lost their “totality as a human person” is considered unethical. Discussions over this has been extensively made throughout he 20th century: the thin line between feeding a certain form of fetishism and informing the masses. We are living in an era where we watch the news as if we are at the movies watching an action-packed film; where we become more and more anti-social through virtual societies; where we are surrounded by heavily filtered, highly contrasted, “picture like” photographs. 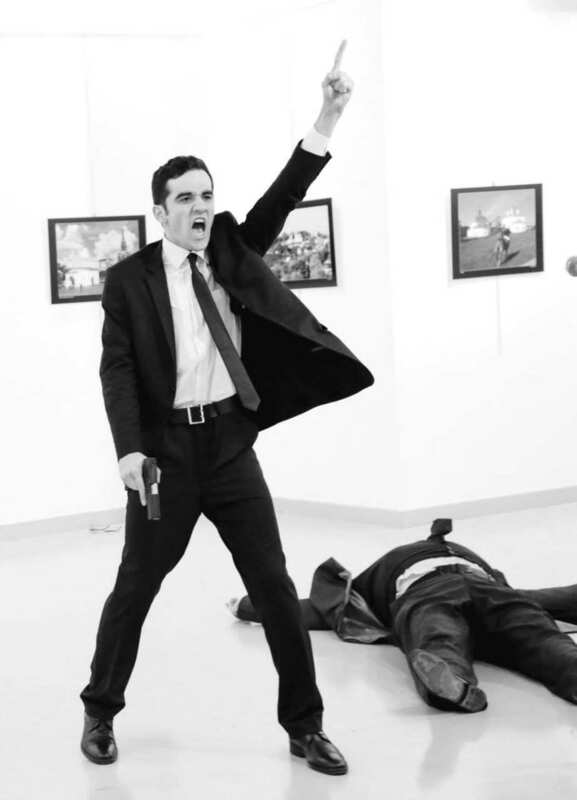 And at such a time as we hail, “photojournalism is dead, long live the new media,” we are confronted by a series of photographs from the moment a murder, that of the Russian Ambassador to Turkey, Andrei Karlov. And suddenly, we feel the ground which we so quickly and so unknowingly became accustomed to, disappear from underneath us. We are surprised, some of us are shocked. We are no longer looking at a series of photographs which have been almost “fictionalized” by slick Photoshop adjustments of light, color and contrast, but rather a series that harbors no special framing or light except what is available from the mediocre indoor floods of a spartan art gallery, and carries the simple, straightforward technique of downright photojournalism. The confrontation slowly makes us realize how, in context, this kind of simple straightforwardness can be so striking: the assailant, the gun, a body that is somewhere between life and death lying on the ground in front of small, framed pictures of pastoral scenes hung on the cool white walls in the background, not quiet covering them, and in stark contrast to the act of violence unfolding immediately before them. Once more we are appalled by the fact that death can be so imminent, so spontaneous. Hours after these images are serviced we start reading praises and critiques from different art and media outlets posted on the internet. Some commentators take the matter further by comparing the photographs to modern day Caravaggio. The main focus in all these images is the assailant and Karlov’s bloodless, lifeless body lying on the ground. With that staged feel the photographs lift and carry us from an actual scene of conflict, to a sterile stage set for an epic theater play. Wendy Lesser mentions Weegee‘s work extensively in her book, focusing mainly on his coverage of the murders in Manhattan’s lower east side circa 1930-1940. He is often the first one on the scene, sometimes arriving there even before the police comes around. He does not pick or choose, he photographs an ordinary fight at a local bar just as fervently as he documents the aftermath of a mafia pay off. His are black and white photographs, with the harsh light of his camera’s flash lighting up the center. Eventually, and through his perseverance, they begin to don the front pages of the New York newspapers. Through all his hard work and throughout his self invented profession as a “freelance” photojournalist, with his car converted into a mobile darkroom, and his ability to tap into wireless police channels, what Weegee was possibly trying to catch was what Burhan Ozbilici caught that evening, by unfortunate coincidence, at the Ankara Contemporary Arts Gallery: the actual moment of death. That, and our pure awe and attempts at bearing witness: curiosity. Once he was done photographing the murder scene, Weegee would ultimately turn his camera on the audience. This is something not a lot of photojournalists actually think of doing. Thus Weegee, by photographing the crowd gathered at the scene of the crime, was in fact taking his profession one step further. In his photographs we see people who are pulling at each other to get a good view, or are “dressed up” for the occasion knowing there will be press there and thus prepared for their 15 seconds of fame, the possibility of accidentally getting into any odd corner of a frame: smiling, posing women, laughing children. Now that crowd is us, running over to our mobile devices following the assassination, watching the moment of death over and over again, and from different angles, sharing images as more become available, liking them, commenting on them, and trying to maximize our own visibility through taking advantage of the elusive populism effused from a series of photographs. “Do not be surprised if you see this scene in a Hollywood movie soon,” or “the assailant’s moves look straight out of Saturday Night Fever,” the imminent desire to sterilize and fix in time an otherwise grotesque subject matter, creating virtual proofs for our individual “not scared of death” narratives. Susan Meiselas, while documenting the 1979 Revolution in Nicaragua, captures a frame which soon becomes the representative sum of her extensive archive from that period, and be used by different artists working with a wide array of mediums, in turn evolving the image into a solitary icon devoid of time and context. Molotov Man is born the moment Meiselas presses her shutter button, and carries Pablo “Bareta” Arauz as he is getting ready to throw the lit molotov cocktail he holds in his right hand in time. This photograph becomes integral to all future narratives of the Nicaraguan Revolution. Meiselas photographs Arauz on July 16 1979, “on the eve of the day that Somoza would flee Nicaragua forever.” Soon after the Sandinistas take control, the photograph turns into an icon. Molotov Man freezes Arauz’s movement, framing an act of violence he is about to commit. His facial expression is self-explanatory, and his semi-civilian clothing tell us he is part of the opposition. All of this visual information also gives us an idea as to who he is about to throw the Molotov to. And it is exactly these “external” details that accentuate the confusion surrounding Bilici’s images from the Karlov assassination. We expect Arauz to throw a Molotov, but for Karlov’s assailant, the external qualities by which we choose to define him are a mix of “clean cut” and “elegantly dressed”. These definitions in turn, determine our own level of surprise. And, inescapably, we romanticize, “he looks just like James Bond in that frame.” Now that is the blurry line between reality and fiction, which Lesser talks about. As Molotov Man turns into an icon, it starts popping up as illustrations and a much controversial oil painting. During its journey which starts off as possibly an archival image for a photojournalist/documentary photographer, it slowly evolves into art and while doing that its context slowly starts to disappear. Possibly the most agonizing and much talked about stage of this inevitable evolution is when a New York based artist Joy Garnett turns the image which Meiselas produced, into an oil painting and includes it in her solo exhibition titled Riot. Garnett’s inclusion of Molotov Man in her exhibit as one of her paintings opens space up for arguments on release (permission), copyright and most importantly, context. The sides to the controversy, Garnett and Meiselas, over the long run, pen an article in 2007 for Harper’s Magazine’s February issue. In this rare “face off”, Meiselas accuses Garnett of taking Molotov Man out of context through isolation and minimization. According to her argument, this image has a meaning only within its own context and she believes that Garnett’s rendition of it is yet another step to lose Arauz, in his identity as the Molotov Man, in the chaos we call pop-culture. Meiselas ascertains that none of the images in the Riot exhibit, including the painting of Molotov Man by Garnett, imply “resistance” or “riot”. By saying that she means to tell us of a deeper narrative: Molotov Man, while within context, documents the end of a dictatorship. Meaning, he is not just any Molotov throwing guy, at any given time of any odd protest. She tells us that in the photograph, Arauz, being part of the anti-Samoza camp, is about to throw the Molotov cocktail he is holding to one of the last national guard garrisons controlled by the Somoza regime.